Despite the availability of used clothing reuse depots and for-profit thrift shops like Value Village, less than 24% of Canadians donate their used clothing. Instead they are more apt to throw them out with their regular garbage, even though 98% of textiles are completely recyclable, regardless of condition. At TWD, we get it. Despite best intentions, Canadians busy people, and making even just one extra trip to a donation depot may not be feasible in our ‘every minute counts’ lifestyle. Knowing that many thrift stores are for-profit despite their affordable pricing, some residents are even less inclined to make the extra trip. 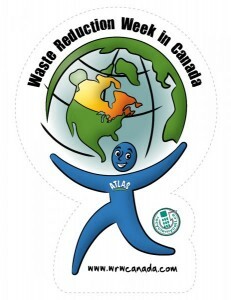 TWD decided instead, to make donating textile waste easy and convenient thing for Ontario residents. We collect exclusively on behalf of registered charities, offering expertise and logistics that can help them maximize their sustainable fundraising potential. 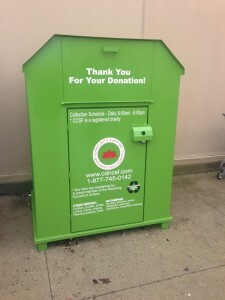 We provide Ontario municipalities with free used clothing donation bins that are hosted by businesses and property managers in areas residents are likely to go anyway. With TWD’s clothing donation bin system, you could toss a few bags of used clothes in your car, drive to your local grocery store or mall, and find a bin. Our bins painted bright green so they are easy to spot, and are placed where they are easily accessible. You can literally drive up, toss your bags of used clothes into in a bin, and carry on with your errands without making an extra trip. Willa Wick of The Rural Route magazine recently wrote about TWD, “This initiative is a community building block towards a green future, which supports area charities.” Check out her full article, which provides a great description of our clothing recycling program. So, how much good can a few bins in your municipality do? Let’s do the math. A well placed bin can average about 600lbs of clothing donations a day. So, lets say you have 11 bins in your community. 600 lbs x 11 bins = 6,600 pounds per day diverted from the local landfill. 6,600 per day x 365 days a year = 2,409,000 pounds diverted from your local landfill each year. That’s almost 2 tons, from just one small area! Additionally, when textiles are reused instead of made from raw materials, it saves 717 litres of water. 717 litres x 2,409,000 = so many litres of water saved that our calculator couldn’t handle it! Every tonne of discarded textiles that is reused saves 20 tonnes of CO2 from entering the atmosphere. Also consider, every 1000 tonnes of used textiles collected creates seven full time and fifteen indirect jobs. When we send it to landfill, it only creates 2 jobs. Knowing that after all this, charities benefit from proceeds, just makes it all the more wonderful an option! Ensure donations are dry and bagged to preserve their integrity. Research who you are donating to. Call the number and visit their website. Do they do the kind of community work you believe in? Bins that offer little to no information may belong to industry pirates that use your donations for their personal gain. If you see a bin is full or area around is messy, call the service number on the bin and leave a very detailed message. You may just help the charity avoid being fined or losing the location! Reputable organizations will ensure that bins are meticulously maintained and service calls will be responded to promptly. If you see someone acting suspicious or tampering with a bin, call your local police service. To find out if the organization that owns the bin is actually a registered charity, look them up at Revenue Canada’s Charity Listing.